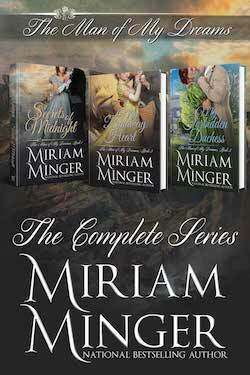 Enjoy three of award-winning author Miriam Minger’s Regency romances: Secrets of Midnight, My Runaway Heart and My Forbidden Duchess! A sheltered but impetuous young beauty, Lindsay Somerset would risk anything for a succulent taste of wild adventure–and Jared Giles, the dashing Earl of Dovercourt, is the answer to her prayers. A gallant and fearless gentleman, he is rumored to be a spy–and the ideal man to fulfill Lindsay’s most cherished, unspoken desires. But once aboard ship on a raging sea, Lindsay realizes her bold hero has a dark secret and passions that know no bounds. Walker Burke never imagined the startling truth behind his birth would bring him back to England after he’d been banished as a traitor. Now he must take a wife—and his father, the Duke of Summerlin, has forbidden him to marry anyone but a noblewoman. Yet when Walker spies the stunning parson’s daughter he hasn’t seen in three years, will he defy his father’s wishes and make her his bride?